It being the first year in our home—and before that living with my in-laws, and before that living in apartments, with no real desire to "deck the halls"—we had a severe lack of holiday decorations. The holidays are always a little crazy for a crafty person like me. I always have several handmade gifts planned for people, crafted and non-crafted gifts to wrap creatively, plus now that we have a baby, I feel like it's necessary to send out Christmas cards. The holidays are crazy! . . . thank goodness I've gotten out of cooking thus far! So, back to the craft, I wanted to make a few decorations that weren't too time consuming. 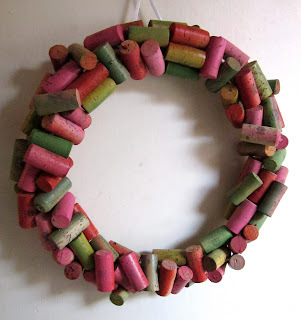 After scouring the internet, I found this cork wreath. Wreaths tend to be quite cheesy, but the corks seemed fun and a little refined. Also, we drink wine quite frequently, so it's not entirely out of character for us to decorate with corks. Knowing we had very few decorations, my mother-in-law had bought us some glittery letters, one for each of our first initials, and one for our last. I put the three first initials on the tree and decided to put the last initial inside the wreath. Yes, the "C" is for our last name. Not for my first name or for "Christmas." 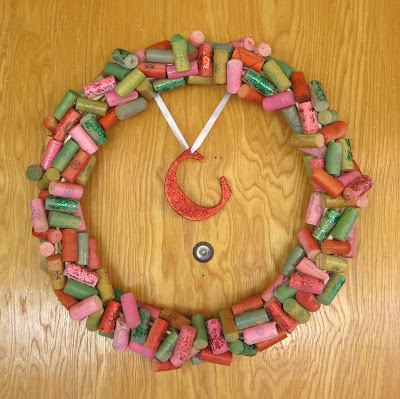 I felt the matte wreath with the glittery letter would have looked weird, so I covered a few of the corks in glitter. I sort of wish I'd used the small glitter, like what's on the letter, but I had big glitter, so that's what I used. I think it looks quite good, and prettys up our uglier-than-ugly front door. A dollar store wreath made of braided willow or some type of natural cane. Ribbon to tie on letter and hang up wreath. As mentioned above, we know a few people who work for wineries (it's wine country for heaven's sake!). We were collecting our own—but just looking at the bag of corks, and imaging how many I still needed, was threatening to give me alcohol poisoning—so I put out the word, and got TONS!! So many, in fact, that I was able to make another wreath for the back/kitchen door. I actually bought this small wreath for the front door, but when I got so many corks, I went back to the dollar store and got the larger wreath for the front. It was a fun project (or projects). I got to use two of my favorite crafting supplies: spray paint and hot glue. Spray paint is great, makes painting strangely shaped things fun and easy. But there are major downsides, like the fumes and needing many many coats (depending on the color/brand). Hot glue is the best! Whoever invented this stuff . . . I want to give her/him a big hug. It's so great. Well, happy (almost end to the) holidays! I kind of wish I drank wine so something like this would look more appropriate on my door! It turned out so beautiful. I love the colors and that they aren't boring red green and white. The hanging C is perfect!